DETROIT/NEW YORK (Reuters) -- General Motors has turned to two investment banks to help it come up with a response to a shareholder group demanding $8 billion in stock buybacks and a seat on the board of the automaker, the company told Reuters. 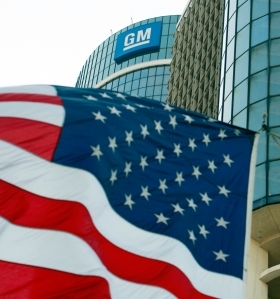 The automaker is working with Morgan Stanley and Goldman Sachs Group Inc for advice on how it should deal with former U.S. auto task force member Harry Wilson and four hedge funds that are pushing for the company to dip into its $25 billion in cash, GM said today. "We are working with a set of advisors including Goldman Sachs and Morgan Stanley," GM said in a statement in response to Reuters. Morgan Stanley and Goldman Sachs declined to comment. Wilson, 43, has joined with David Tepper's Appaloosa Management and three other hedge funds: Taconic Capital Advisors, Hayman Capital Management and HG Vora Capital Management, which together own about 31.2 million shares, or 1.9 percent of GM stock. Both banks have historically worked closely with the Detroit automaker. Morgan Stanley helped GM during bankruptcy restructuring in 2009 and its initial public offering the following year, and GM President Dan Ammann is a former Morgan Stanley banker. Goldman Sachs advised GM on its partnership with French automaker PSA Peugeot Citroen.